Get ready for more superhero/cartoon animal team-ups. Following a fifth week event in 2017 which teamed DC superheroes with characters created in Hanna Barbera cartoons, and a follow-up that teamed the heroes with the Warner Bros.-owned Looney Tunes, Super Sons writer Peter J. Tomasi has seemingly pulled back the curtains on a third such event. 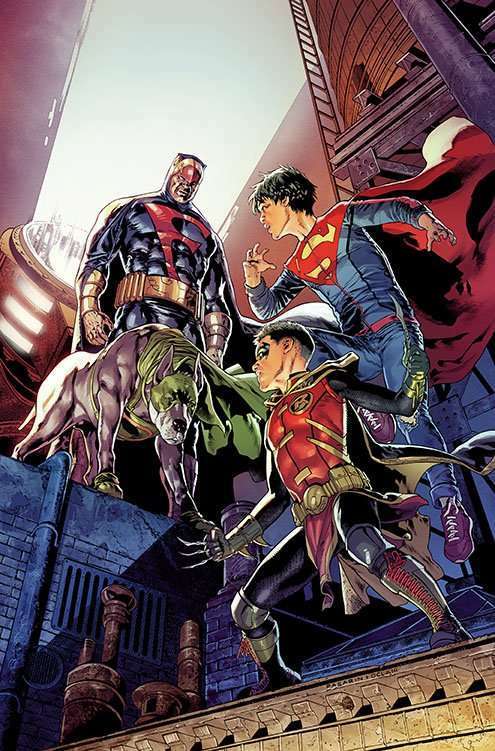 With fans anxious over his comic's cancellation and not entirely soothed by his reassurances that he is not yet finished with Robin and Superboy, Tomasi shared an image on Twitter that he hoped would help. "Here's a little surprise to ease the temporary pain," Tomasi tweeted, with the image above. "It's coming out the fifth week in May but didn't make Previews (will be in June issue of Previews). Super-Sons/Dyno-Mutt Special #1. 38 pages of our boys knocking heads with Dyno-Mutt and the Blue Falcon!" This does not guarantee that DC will have more such crossovers in May, but it stands to reason. Fifth week events have become a staple of the comics industry in the age of the direct market. Most comic books are published on a monthly schedule, and all mainstream comics are released on Wednesday. Because there are generally only four Wednesdays per month, comic books ship on a four-week shipping schedule. Once in a while, there are five Wednesdays in a month -- and those times, there will be nothing scheduled. Annuals, one-shots, and late-shipping books commonly fill the scheduling hole, but as comic book specialty retailers became the source of the vast majority of comics sales, some began to notice that such comics rarely generated enough attention to drive significant numbers of readers to the comic shop on fifth weeks. As a result, Marvel and DC have periodically made big-but-self-contained event stories like Amalgam Comics, The Kingdom, and the first run of Tangent Comics fifth week events, forcing readers into the shops in spite of a lack of their regular books. Both the Hanna Barbera and Looney Tunes team-up stories were fifth-week events for DC in 2017. Last time around, Booster Gold met The Flintstones, while Green Lantern teamed with Space Ghost. The Suicide Squad faced the Banana Splits while Adam Strange hung out with Johnny Quest and the rest of the Future Quest company. Each of those one-shots, marked as annuals, featured a backup story that set the stage for incoming DC/Hanna Barbera books like The Jetsons and The Snagglepuss Chronicles. With few exceptions, DC's Hanna Barbera comics have lasted a year or less at a time, with new waves of titles rolling in to replace the outgoing ones.